There are several lines on the cliffs above Tennevoll (shown on map), and also quite a lot on the north side of the Spansdalen valley (not shown above as we didn't get any photos or exact locations). We didn't do any of these as they looked mostly fairly easy (apart from some VERY high up) and were pretty sun battered, but they are certainly worth checking out and there could be quite a few lines all the way up that side of the valley. This is a picture from the line called 'Hangover' and is described in the guide linked above. The main event is Henrikkefossen, on the left below, a six pitch WI4/5. On the right of it is Soylefossen, a four pitch WI5/6. For both, just park by the bridge and walk up the road (there is no parking available on the smaller road). 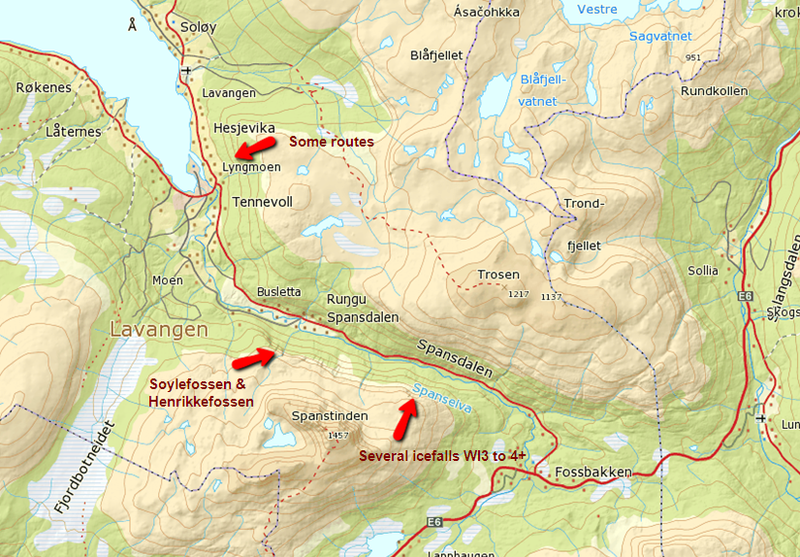 I'm loocking for accomodation in Spansdalen Valley. Can you say me what possibilities have for host in the zone? for accom - http://aagaard-lavangen.no/en_index1.htm is where we stayed. No other info on the climbs than what we wrote above I'm afraid. Best of luck! A great Hotel to stay for climbing is Gratangen Fjellhotell. Have a large drying room for equipment and Sauna for tired climbers. Some of the staff is keen climbers and can help with route info.